The production of the well known Porsche 918 Spyder starts in September, mean while the engineers keep developing and improving the german hypercar all around the world. Last week I had the opportunity to film six of them on the French Coast and now another testing mule has been spotted while lapping quickly the infamous Nürburgring. It's particular to see (or better, to hear) the pretty awesome exhaust note coming from the 4.6L V8 engine, it might be the best sounding testing mule of this car out of the many spotted, and we really hope the final production version will keep this sound! 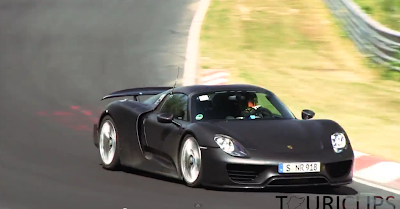 Oh, in case you've missed, here's my unexpected sight of six Porsche 918 Spyders driving around. Did the COncept one, with exhaust pipes on the sides, ever get to streets?